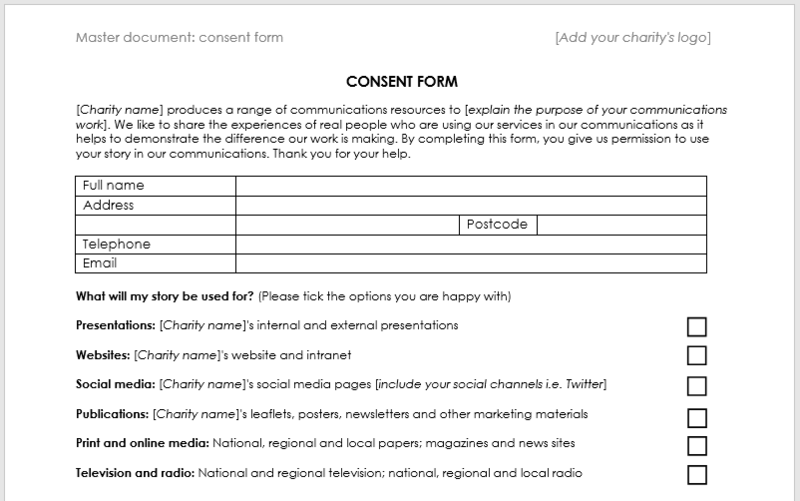 Are you creating a case study consent form for your charity? Make sure you’ve gained informed consent to use all your best case studies by adapting our template, based on forms from across the charity sector. Consider exactly who will need access to your case studies. Will it only be internal staff, or will third parties also be using them? Does this need to be reflected within your form? We’re eager to keep improving the quality of our resources, so if you have any feedback on the template, please let us know in the comments below. This template was created by Kellie Smith. Thanks to Catch22, Gingerbread and Parkinson’s, all of whom submitted consent forms to help us come up with this template. Most importantly, thanks to all our members for making this possible. We’re only able to offer this template for free because of the support of our members. If you’d like to see more template documents like this, and benefit from free events, peer support and knowledge sharing, get in touch with Sarah to find out more about becoming a CharityComms member. We’re expanding the range of documents we have available and we need your help to create more. If you have ideas for other templates we might create, please let us know in the comments below or email Christine with your ideas. Even better, send us examples of the documents you use, so we can create a template version for everyone.